Heat oven to 425°F. Lightly grease or spray 2 cookie sheets with nonstick cooking spray. Unroll 1 can of dough; place on greased cookie sheet. Starting at center, press out dough with hands to 14x11-inch rectangle. Repeat with second can of dough and cookie sheet. Bake both crusts at 425°F. for 7 minutes or until set. Remove crusts from oven. Spread 1/2 cup barbecue sauce over each crust. 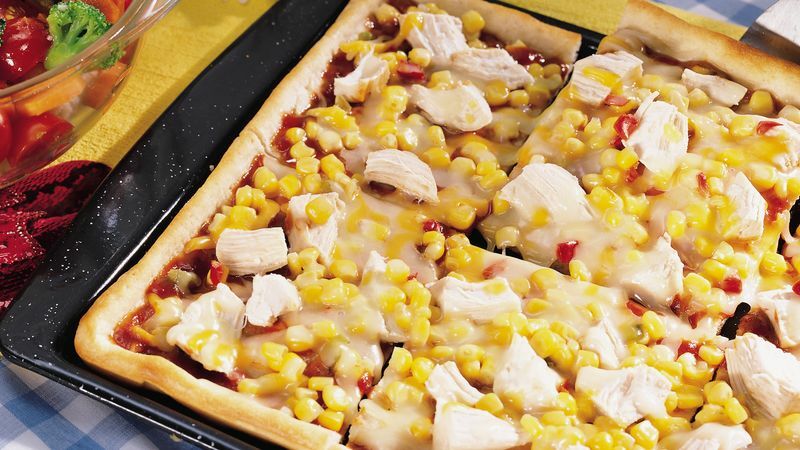 Top each with chicken, cheese and corn. Return to oven; bake an additional 8 to 10 minutes or until cheese is melted and crust is golden brown. Cut into squares to serve.